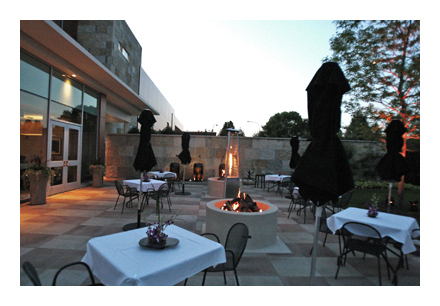 Throughout its two-year history, Waterleaf restaurant on the campus of College of DuPage has become a sought-after venue for private events. Its exceptional food and service provided by a professional staff, paired with its beautiful flexible space, makes it an ideal spot for both corporate and social occasions. "Waterleaf's spacious, natural ambiance, with a view overlooking a scenic lake, creates a comfortable, relaxed mood," says General Manager Jean-Pierre Leroux. "Business groups enjoy the space because it is perfect for meetings and celebrations. Social hosts like the fact that there are several different areas in the restaurant that can be used to orchestrate a milestone event such as a rehearsal dinner, wedding, baby shower or anniversary party." Waterleaf goes to great lengths to accommodate each individual client. "No matter the style of the event, our staff takes the stress out of event planning and offers a memorable experience," says Leroux. In a location that whisks you away from the hustle and bustle, Waterleaf's functional, intimate spaces create the perfect locale for daytime luncheons or evening gatherings. The physical space includes a bar/lounge area which can accommodate 20 people. The private/semi-private dining room accommodates 20-65 seated guests. The main dining room accommodates 120 people seated. Silverleaf, the corporate meeting room is a beautiful space for groups of 12 to 100 people. A state of the art audiovisual system is also available. All dining areas feature floor to ceiling windows that overlook a beautiful lake. An outdoor patio, available with propane heaters, and the lakefront grounds outside the restaurant are also available for private events. Waterleaf's exceptional standards of food and service are a key reason why the restaurant has earned the praise of event planners. 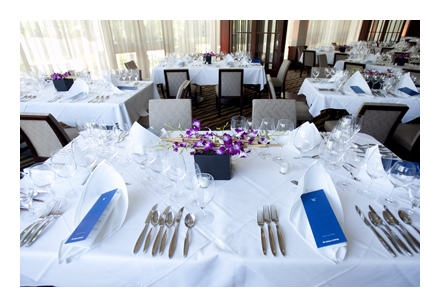 "We give our event guests the full Waterleaf culinary experience," says Leroux. "We offer them the same outstanding food and service our personal diners expect. For event planners, that means we will accommodate virtually all of their needs and create a comfortable yet professional atmosphere that acknowledges the importance of the event but doesn't feel stuffy or contrived." "When we host private events we maintain our highest standards of food preparation and presentation," says Executive Chef Nadia Tilkian. "Everything is prepared from scratch, using the freshest, best quality seasonal ingredients we can source. We do not take shortcuts for the sake of efficiency in serving a large group." Menu planning is straightforward. Waterleaf uses several sample menus as starting points and then Chef Tilkian adapts the menu to meet the needs of the guests. "Some hosts want to serve special dishes or desserts, which we are more than happy to prepare," she says. "We also bend over backwards to meet the needs of people with dietary restrictions or food allergies." Events include full table service. Waterleaf is a perfect setting for a wide range of occasions: meetings, corporate parties, new product launches, birthday parties, holiday parties, anniversary parties, engagement parties, bridal and baby showers, weddings and private wine dinners. For more information about private dining at Waterleaf, please contact Corporate, Social Sales Manager Aaron Heitmann at Waterleaf by calling (630) 942-6881.